A major global manufacture of roofing materials suffered a deep-seated fire in a large 20,000 gallon mixing container that spread via duct work to multiple sealed containers. 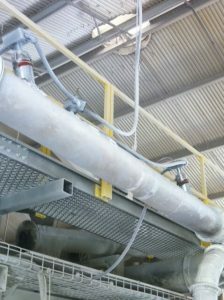 In order to prevent the spreading of fire though the duct work the customer needed to find a flexible low-cost effective solution – and quickly. 1. Installation of DAF Heat Detectors in the ductwork. 2. Installation of Dampers to prevent the spread of fire. 3. Installation of a Stat-X Suppression system to suppress the fire and prevent it from spreading.